Etna (Sicily, Italy): The speed at which activity increases is truly impressive. Even from webcams located more or less downwind (i.e. receiving much ash blocking clear view), the lava fountain is now visible clearly. 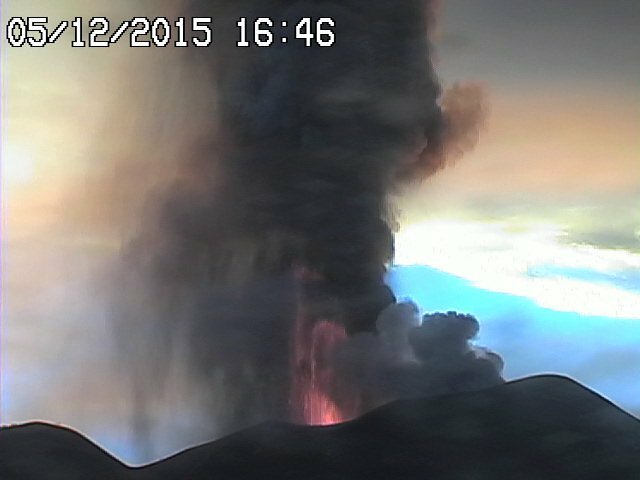 Rinjani (Lombok): (5 Dec) The volcano continues to erupt, but activity has decreased a lot. When visited during 30 Nov - 2 Dec, "the volcano erupted just 2-3 times eruption per day", but some explosions were fairly big (s. image attached). Bromo (East Java, Indonesia): (5 Dec) An eruption warning was issued this morning - PVMBG raised the volcano's alert status to "siaga" (alert), or 3 on a scale of 1-4. Telica (Nicaragua): (5 Dec) The volcano has calmed down, at least at the surface during the past week. Since 29 Nov, no more significant explosions / ash emissions have taken place. Momotombo (Nicaragua): (5 Dec) Activity at the volcano continues, but at lower intensity than during the first days of the new eruption. Strombolian explosions at the summit crater accompany the emission of a steam-ash plume rising up to approx. 1000 m, an possibly still continued, but very weak lava flow extrusion.